Clayton Thorson throws the ball. The junior quarterback will look to lead the Wildcats into a successful conference season. Northwestern topped Bowling Green on Saturday night to stabilize its season after a rocky start. Now, as the Wildcats head into a bye week, The Daily’s football writers discuss the team. 1. Through three games, NU sits at 2-1. It now faces a brutal three-game stretch including games against No. 9 Wisconsin, No. 4 Penn State and Maryland. What would a successful showing in this stretch look like? Tim Balk: Sorry to be dramatic, but this stretch will make or break the season. Things get a bit more manageable after Maryland, but the following games against Iowa and Michigan State will become that much tougher if the Cats are buried under the bad mojo of an 0-3 start to conference play. So winning at least one is a must. Winning two would set NU up to compete for the Big Ten West title. Neither of these results are entirely beyond the pale. The Cats played their best in tough games last year, and they were an upset or two away from contending for the Big Ten West title. Max Gelman: A successful showing is beating Maryland (clearly worse than NU) and stealing one of the two games against Wisconsin and Penn State (both clearly better than NU). I don’t care what teams the Terrapins played — Texas is not, in fact, back, despite everyone and their mother saying so. But the Badgers and Nittany Lions present real challenges. If the Cats finish this stretch 2-1, with a win over a top-10 opponent, that should be a success, no question. Ben Pope: If the Cats can stay competitive with either Wisconsin or Penn State, even if they fall by one or two scores in each, it will be an encouraging sign for a solid 7-5 or 8-4 campaign. If the Cats pull off an unlikely upset, however, NU should immediately vault back into the Big Ten West title conversation that the Duke loss knocked it from. For the record, the Cats’ strength in the backfield and weakness in the secondary should match up far better against the steady, physical Badgers than the fast, dynamic Nittany Lions. 2. Clayton Thorson has sandwiched a poor performance against Duke with two strong performances at home against weaker foes. What can the team expect from its junior signal-caller for the rest of the season? Cole Paxton: We can’t reasonably expect Thorson to regularly match his performance against Bowling Green, given the Falcons’ atrocious defense. Still, the Duke performance — when he could barely compete a pass or even find a receiver who was somewhat open — will probably end up being his worst of the season. NU’s offensive line remains below average and a significant liability, but Thorson has the talent and poise to make up for that — in most cases. I fully expect him to lead his team on a couple game-winning, fourth-quarter drives in Big Ten play. Max Schuman: Thorson’s struggles against the Blue Devils were troubling, and his rebound against the Falcons can’t totally erase that. Duke threw blitzes at NU and challenged the Cats’ receivers in coverage, and Thorson wasn’t sharp enough to elevate his offense when everything around him was falling apart. 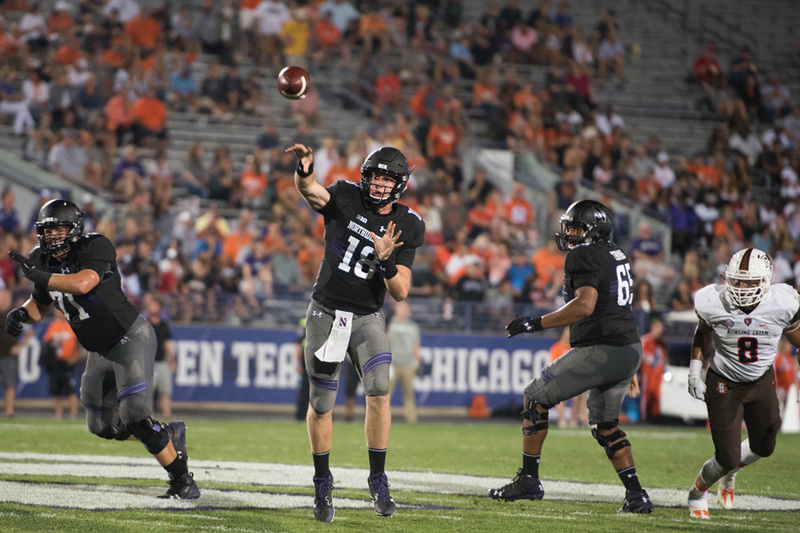 Not every team left on NU’s schedule will be able to rattle Thorson that way, but against top defenses in the Big Ten that pose similar problems, the Cats’ quarterback will have to play at the top of his game to lead his team to victories. I’m just not sure he has that in him. Balk: I’ve been riding the Thorson bandwagon for a while now, and he seems to continue to make strides as a passer. This, in combination with a strong receiver corps, sets NU up for a huge passing year. He could throw for a 4,000 yards, but the Cats need to fully embrace becoming a pass-first team. As long as a significant share of his passing attempts come on second-and-long or third-and-long (as has too often been the case in nonconference play), NU will see uneven production from both Thorson and the offense as a whole. 3. Despite ending nonconference play on a high with a 42-point win over Bowling Green, the Cats often struggled in their early season slate. What is a greater area of concern: the offense or defense? Pope: The defense — and particularly the secondary — is an area ripe for exploitation by the Big Ten’s more explosive teams. With cornerbacks Keith Watkins, Brian Bullock and Roderick Campbell all out for the season and Marcus McShepard, Alonzo Mayo and Trae Williams all either injured or recently returning from injury, NU has absolutely no depth in its defensive backfield. Given the Cats’ track record of struggling against mobile quarterbacks — see Duke’s Daniel Jones and Nebraska’s Tommy Armstrong as memorable examples — the likes of Penn State’s Trace McSorley should be licking their chops about facing this defense. Paxton: It’s definitely the offense, and for one reason: the offensive line. The defense has struggled, but secondary depth will improve some, and even on bad days the defensive line is competent. As the Duke game showed, that isn’t always the case for the offensive line. When that unit plays especially poorly, the offense has no recourse. Thorson and senior running back Justin Jackson are outstanding players, but even they can’t make up for a unit so porous it barely seems to have five players on the field. Gelman: For me, NU’s defense is the bigger concern right now, specifically the defensive depth. The Cats have sustained a lot of injures in the secondary, and the run defense doesn’t look the same without Anthony Walker (obviously). I still think Paddy Fisher and Nathan Fox don’t have enough experience to fill that stopgap role yet. NU’s defense was the backbone of its 10-win season two years ago, but this year the offense will have to pick up the other side. Schuman: The defense is not great, but it’s fine, and it has probably played at about the same level in each game this season. Its worst showing, against Duke, was mitigated by the more than 40 minutes it spent on the field; its best showing, against Bowling Green, was mitigated by the weakness of its opponent. The offense is the unit to watch closely for the rest of the season. The Cats need their offense to play well to beat good teams, and an inconsistent Thorson, a weak offensive line or a poor game plan from offensive coordinator Mick McCall could torpedo the team on any given Saturday. The margin for error isn’t high on that side of the ball if NU hopes to compete for a spot at the top of the Big Ten.